A new range of Landini ‘stockman’ tractors available with a comprehensive choice of transmission packages will make its UK debut at the LAMMA show being held on 8/9 January 2019 at NEC Birmingham. A generous standard specification includes an air suspension driver’s seat, cab air conditioning and a radio/media player with Bluetooth for hands-free phone use. Front and rear windscreen wash/wipe and a push-back hydraulic pick-up hitch are also included in the package. Standing on a 2355mm wheelbase and weighing in at 3800kg, the Landini 5 Series tractors are the latest models from Landini manufacturer Argo Tractors to take up Deutz power, with the 3.6-litre four-cylinder engine having only a maintenance-free diesel oxidation catalyst (DOC) to meet latest emissions rules. Power outputs peak at 99hp, 107hp and 113hp, with generous torque helping the tractors put in a lively performance. Having a variety of transmission options, including a choice of mechanical shuttle with 12in dual clutch and power shuttle with wet clutch technology, makes it possible to equip the tractor ideally for different tasks, whether working predominantly on yard work with a loader or mainly engaged with field work, or a mixture of the two. As standard, the 5 Series tractors come with a 40kph Power Four synchro shuttle transmission providing 12 speeds in both directions. A creeper can be added for extra speeds or two-speed powershift with the T-Tronic version with giving 24×24 speeds, which is ideal for loader work, a creep version with 32×32 speeds is also available. Finally, Eco 40kph may be chosen on powershift versions, which enables the tractor to cruise at lower engine speed for greater fuel economy. There is also a good choice of pto options – 540/1000rpm is standard, with 540/540E a no-cost option for added economy with light-duty implements, and a four-speed alternative caters for more power-demanding implements. In the attractive cab, which has been very well received on Landini 4 Series tractors, the operator is treated to air conditioning as standard, along with a multi-media entertainment system, an air suspension seat and a roof window for good visibility to a raised Landini loader. 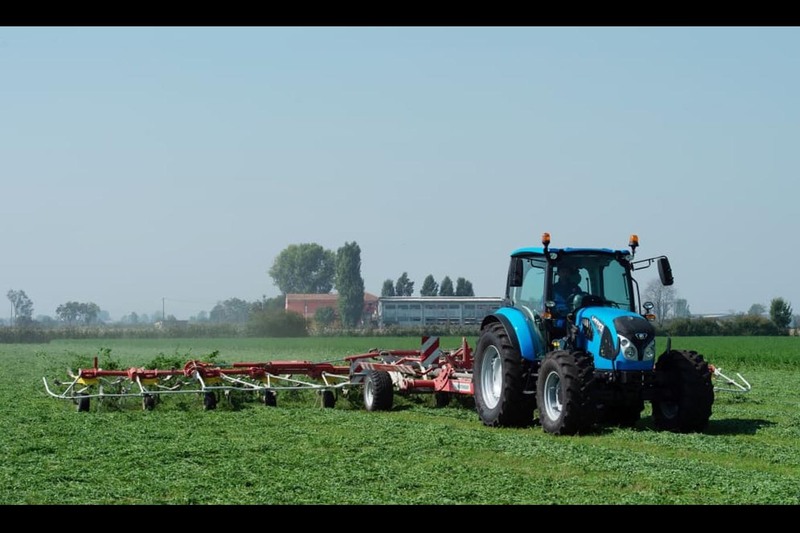 The tractors are available through Landini sales, service and parts dealerships located throughout the UK and Ireland.